Earn $14.00 in Rewards credit (1400 points) What's This? 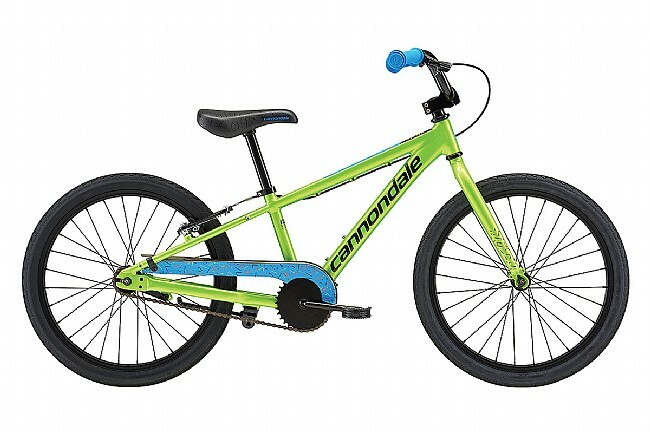 Cannondale’s 2018 Trail 20” Boys Single Speed Bike features an optimized 6061 alloy frame, 20-inch wheels, and a rear coaster brake; ideal for building skills and transitioning from training wheels to a geared off-road bike. Frame Material: Optimized 6061 alloy, smooth welding. Fork: 6061 Alloy rigid, 1-1/8" steerer, w/ canti mounts. Headset: Tange Seiki Alloy, 1-1/8" Ahead, integrated. Cassette / rear cogs: KT 18t. Brakeset: Front V-Brake, rear coaster brake. Handlebar: Alloy, 560mm wide, 25.4mm. Rims: Alex Z1000, single wall, 36 hole. Hubs: KT hubs, nutted axles, rear coaster brake. Tires: Cannondale 20x2.0", wire bead.